According to the experts, a drip irrigation system is the best choice for a vegetable garden. Coming with many advantages and few disadvantages, this system helps plants thrive while saving water in the long run. But with a wealth of drip irrigation systems available on the market, how to choose the best one? Should you consider the size of the garden? Alternative uses? When should you consider an alternative irrigation system? When confusion arises, we’re here to help you find the answers to your questions. But if you’re in a hurry and don’t have the time to read, click on the links below and check out our top picks. Why Invest In A Drip Irrigation System? How To Install A Drip Irrigation System? A drip irrigation system consists of a long hose with small holes - called emitters - located at determined distances along its length, that connects to a water source through a valve. Between the valve and the hose, which is called drip tubing, is located a system composed of a filter, pressure regulator, and a backflow preventer. The hose is stretched along the garden rows next to the plants, paying attention to position the emitters next to the plants. Thanks to the flexibility of the tube, it’s easy to arrange the dripping system in any desired layout, and the drip tubing can be extended by interconnecting two or more tubes of the desired length. To water the plants, the drip irrigation system releases water slowly at or near the roots of the plants. This maximizes irrigation efficiency because water soaks into the soil immediately, thus it doesn’t evaporate. Then, water is applied only where is needed, aka to the roots, minimizing waste. If you’re not yet convinced, here are three reasons to invest in a drip irrigation system. There are various types of irrigation systems to consider, but drip irrigation is the least expensive. Its low cost and wide applications attract most homeowners and gardeners to invest in this solution. In fact, drip irrigation is ideal to use in the vegetable garden but also in a flower garden or in an orchard. Thanks to an easy installation and versatility of the design, drip irrigation is even suitable to use on roof gardens or terraces. Kits are available commercially or you can ask for expert installation. Of course, DIY installation cuts off costs even more. When it comes to water saving, drip irrigation is the most effective. With an efficiency of about 90% or over, drip irrigation minimized waste but also helps plants thrive by providing water only where is needed. Drip irrigation works wonders in a vegetable garden, but also under the hedges. Versatile and almost invisible, drip irrigation systems are often used by landscapers in exterior design. Drip irrigation systems are versatile and adaptable. You can install them in gardens of all sizes and shapes thanks to the flexibility of the tubes. Emitters can be installed at variable distances and adjusted to release water only where needed. Despite being inexpensive, efficient, and adaptable, drip irrigation is not always the best option. Tropical plants might have different watering requirements, for example. Here are two alternatives to consider. Sprinkler irrigation systems are very popular and have a watering efficiency of about 75-80%. Creating a mist of water, the system simulates rain and is ideal for a tropical garden or plants that love having the leaves soaked. However, the system wastes the most water. Because water arrives first on the higher parts of the plant, it takes more time for it to soak into the ground. Evaporation wastes a good part of this water, and you’ll have to leave the sprinkler on for longer. By damping the aerial parts of the plants, this irrigation system is also associated with mold growth and other plant issues. A soaker hose is similar to a drip system in the way that it delivers water to the roots. Water soaks into the ground immediately and it isn’t wasted by evaporation. However, the soaker hose releases water through its whole length, and in most vegetable gardens this means waste. Yet, a soaker hose works wonders to maintain the hedges green and is also provides sufficient water to a lawn. Raindrip is one of the most popular manufacturers of drip irrigation systems. From its product’s range, our favorite is Raindrip Automatic Container and Hanging Baskets Kit. This customizable system is designed for containers and hanging baskets but can be used in the vegetable garden too. Made of superior quality materials and designed to last for years, the supply tubing is threaded just like a hose and is easy to interconnect and install. Installation requires no tools and the kit can be combined with other Raindrip products to create larger irrigation systems. The tubes and other components are made from linear, low-density and UV resistant polyethylene. The hose can be installed either on the ground or buried and can be left outside all year round, regardless of the temperatures. Another awesome feature is the timer that makes irrigation a no-brainer. A limited 5-year warranty and dedicated customer support add value to the product. The customer support team is very helpful and answers all doubts and concerns. Full kit: the box contains everything you need to set up and install your vegetable garden irrigation system. The product is great to use for potted plants or hanging baskets. Timer: a supplied timer makes irrigation a no-brainer; just set watering times and you can even forget about watering your plants. Drought-friendly: Raindrip products are designed to save water and are ideal to use in areas prone to drought. Quality: all components of the system are made from high-quality linear, low-density polyethylene with UV inhibitors. The system doesn’t come with a pressure regulator, which is needed for an effective functioning. Rain Bird Gardener’s Drip Kit is a drip irrigation system comprising 50 pieces and ideal for multiple application. The box contains everything needed to set up the system, which has a coverage of 75 square feet. Ideal to use for landscaping or gardening purposes, the system comes with a faucet adapter. This makes it easy to connect the hose to the water source for a hassle-free operation. However, a timer is not included and you’ll have to turn on and off the water manually. The distribution tubing has the diameter of a regular garden hose while half inch emitters are distributed along the length of the tube. Stakes and fittings, plus a regulator and faucet connection kit are included in the box. Upon correct installation, the system delivers water to the roots of the plants, minimizing weeding and garden maintenance. Easy to install: this drip irrigation system is easy to install without tools. All parts are provided in the kit and the hose connects to a faucet. Size: the system has a coverage up to 75 square feet and is ideal for most gardens. It’s possible to extend coverage through connectors and additional tubes. Water management: the system is designed to save up to 50% of water compared to a traditional sprinkler system. Reduces weeds: by delivering water directly onto the roots and not on the surrounding soil, the drip systems reduces weed growth. The system doesn’t adapt well to round or curved environments. KORAM Drip Irrigation Kit is an alternative to the two options above, delivering a budget-friendly to those who have large gardens. Covering up to 270 square feet, the system is easy to install and even more easy to use. Designed to save up to 70% more water than a traditional sprinkler system, KORAM boasts more than just a great price. A friendly user manual provides comprehensive information on how to set up the system, and the hose simply connects to a faucet for a hassle-free installation. All accessories needed to create and customize the system are in the box. Flexible tubing ensures adaptability to all spaces; to assemble the parts easier, it’s recommended to hold the end of the hose into hot water for a few seconds before joining the parts. On large areas, it is recommended to use ½ inch tubing for the main line and ¼ inch tubing as branches, to prevent insufficient water pressure. In broad terms, the system needs a pressure between 25 and 45 PSI to ensure sufficient watering. Price: this drip irrigation system is affordable and delivers an excellent value for money. Coverage: designed for gardens of all sizes, the system is customizable and covers an area up to 270 square feet or 25 square meters. Simple installation: putting up the system is easy; the hose connects to a water faucet and all accessories are included in the box. Customizable: whether you need a shorter or longer irrigation system, adapting the tubing to your needs is easy. The kit doesn’t contain a female hose thread; this is not expensive but it’s annoying to have to buy extra parts if needed. Another drip irrigation system we liked is Flantor Garden Irrigation System. 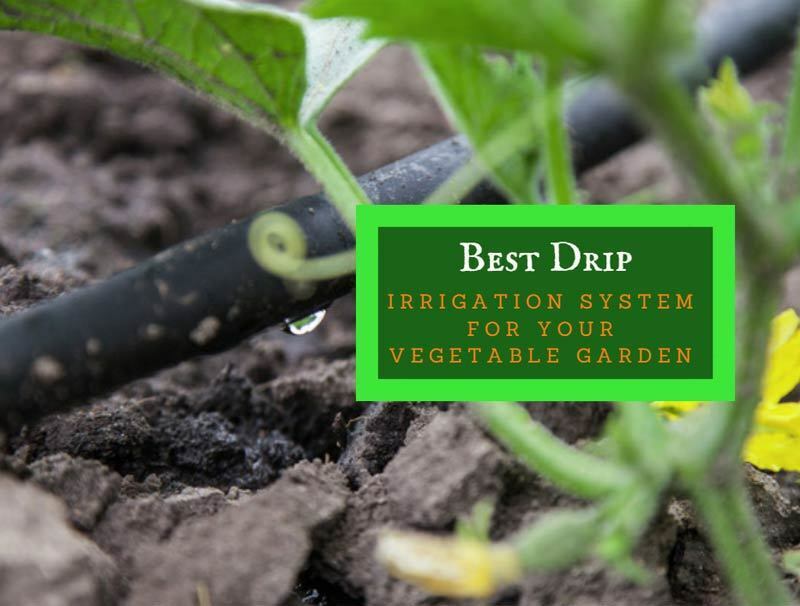 Easy to install and with a covering similar to the model above, the system boasts 50ft of black distribution tubing, twenty irrigation drippers but also twenty atomizing nozzles. This gives the opportunity to customize the system according to your needs. All connectors and couplings are also included in the package. We also like that the system is compatible with automation systems. If you want irrigation peace of mind, all you need to do is to connect the system to a timer, which is not included. Alternatively, just turn the faucet on and off manually. Another great feature is that every nozzle can be adjusted individually. This means you can meet the water demands of different plants in a single step, and for a vegetable garden, this is awesome. Installation is easy and straightforward, and a manual with pictures highlights all steps. Adjustability: each nozzle is easy to adjust individually, and you’ll be able to meet the water demands of each plant at the same time. Versatility: either you need a drip system or a sprayer, the kit contains all parts to install the irrigation system you need. Easy installation: installation doesn’t require any tools and the steps are pictured in a comprehensive user manual. Automation: if you want peace of mind, just invest in a timer and the system will do everything on its own. While the drippers work wonderfully, not the same can be said about the sprayers. Ideal for agriculture or landscaping purposes, MIXC drip irrigation system impresses with a flow rate of about 7 liters/hour. The system saves up to 70% compared to manual watering and provides a precise drip watering that helps plants grow healthy and fast. The irrigation system is compatible with automation systems, although the timer doesn’t come with the kit. Versatile enough to adapt to all watering needs, the system has adjustable nozzles that can be used either as a dripper or as a sprinkler depending on your needs. The irrigation tubing is made of high-quality and UV-resistant materials and is flexible enough to install in any shape you want. As for the fittings, they are made of high-quality plastic that resists daily wear and tear, as well as exposure to extreme temperatures. Easy to connect to any water faucet, the system has a water pressure requirement between 25 and 45 PSI. For this reason, it is recommended to install a pressure regulator between the faucet and the hose. Flexible installation: coming with a 50ft hose made from a flexible material, the drip irrigation system adapts to all garden layouts. Modes: the nozzles can be turned on either as sprinklers or drippers. Responding to all watering needs, the system brings great value for money. Affordable: this system is budget-friendly and made to last. One of the best investments to make. Versatility: thanks to the dripping system, the product can be used outdoors or in enclosed spaces such as greenhouses. The tubing tears out quite fast. From the myriad of drip irrigation systems available on the market, Raindrip Automatic Container and Hanging Basket Kit is our favorite. Despite the name, this kit can be installed anywhere. Ideal for a rooftop garden, potted plants or a veggie garden in the backyard, this irrigation system comes with a timer and brings peace of mind. The system is made of superior quality material. It withstands all elements and can be left outdoors in the harsh weather, even during winter. Although more expensive than similar options, the quality and versatility of this system are outstanding. Undoubtedly, a drip irrigation system to consider. How Long Should I Leave The Sprinkler On? What Are the Best Garden Hose Reels?